The measure would effectively bar any large-scale wind developer from pursuing a project in the town, while allowing residents freedom to pursue small conversion systems at their homes. 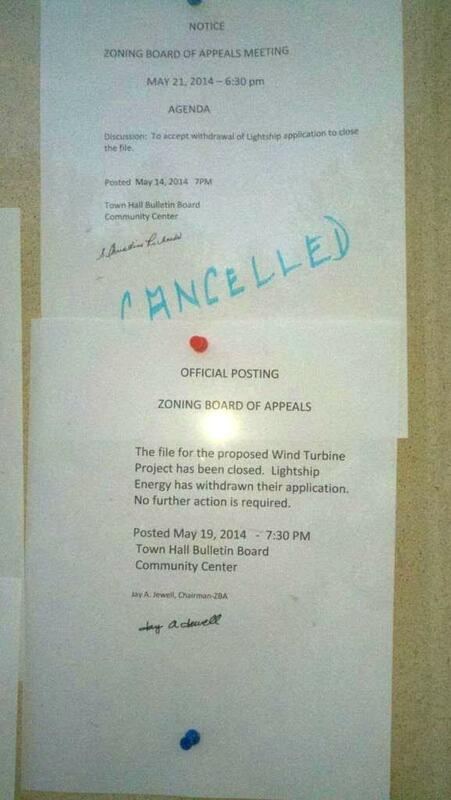 Lightship withdrew its permit application without prejudice on May 19, 2014. The posting appears on the right. Among the contenders are Bonnie DiTomasso and Kevin Cahill, seeking seats on the Select Board. Other candidates are Joseph Kaminiski for moderator, Kimberly Wetherell and John DiTomasso for Finance Committee, Candice Calahan for Town Clerk, and Scott Seely for Planning Board. Thank you Wind Wise for following this little Town and for all of your support and guidance during our fight!